Went out this morning with binoculars. The totality was predicted to be from 5:25 to 6:25 AM CDT. But there were low broken clouds at less than 1,000' due to a low layer of humid air moving rapidly from the South. Only saw the moon through thin cloud, which killed any hope at all of seeing Uranus, which was supposed to be to the upper left of the moon. Even years ago before more population and light pollution here, the sky seemed pretty empty once one looked well North of directly overhead, like a big empty area to the North. Orion was about 45 degrees above the southern horizon this morning during the eclipse so wondering if that is what you saw? The three bright stars in a row could have been the belt. Did you take a look at the 3 stars in your binoculars? If you did, you might have seen a nice fuzzy spot below the belt that would have been the Orion Nebula which looks good to me even in binoculars. Reminds you of Pacman, lol. We had a good view of the eclipse through some intermittent clouds. Didn't really get any great pictures. Not quite as red as I was expecting or have seen in the past but worth the time to look! For some reason I woke up at 5:30, and the early news shows were talking about it. Went outside just as it was becoming total - could almost see the transition if I looked long enough. We had totally clear skies. It didn't seem red, but we're in a Mpls suburb with quite a bit of light pollution. Overall I was impressed - I have never seen a total lunar eclipse before. Fantastic view of it (very) early this AM over the Pacific from our balcony. DS and DD had oppty to get extra credit for AP Chem and Physics, respectively, by getting and shooting video or photo evidence ... so there we all were at 0330. Anyway, very clear sky and dramatic light w/ moon over the ocean on a surprisingly clear (for this time of year at the beach) night. Worth getting up for indeed. Skies were completely overcast so I slept until 9:00. The dogs got me up to go outside at 4:30 so I got to see it. It wasn't blood red. I hadn't planned on getting up early...maybe the dogs wanted to see it? Wandered outside around 4am, looked at the rather brown moon and went back inside and back to bed. Too many clouds lately here. I have been doing a decent job of 'Spotting the Station' this summer though. Me too, except at about 4:30am (PST). My neighbor's cat trotted up to me so I picked him up and we stood on the sidewalk together looking at the nearly completely covered moon. It started at 8:30pm here in Tasmania and was fantastic. A few clouds threatened to spoil the show at one point but soon cleared away. Get ready for the total solar eclipse on Aug 21 2017! Going to be there for that one. Going to have to try to match duration with the chance of having a cloud free sky. Should be pretty good chance in August though. Orion was about 45 degrees above the southern horizon this morning during the eclipse so wondering if that is what you saw? The three bright stars in a row could have been the belt. Did you take a look at the 3 stars in your binoculars? If you did, you might have seen a nice fuzzy spot below the belt that would have been the Orion Nebula which looks good to me even in binoculars. Yes! That was it! Thanks! 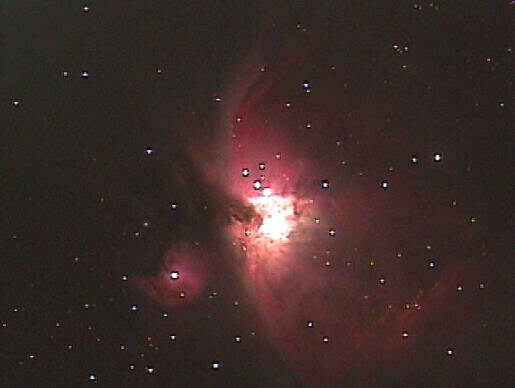 I looked Orion up on Wiki. I had the three stars of the belt of Orion as the dipper base, and then stars down and curving to the left as the handle. And I did notice a fuzzy mass there. When I look up at it, it just screams dipper. What??!! You should have had your DW go outside and check the weather conditions BEFORE considering waking you up! Did you know that one of the constellations is Wham the Frying Pan? Glad I could help. Like most constellation, once I've seen the chart, I can see where they came up with the name. The distinctive thing about Orion is the three belt stars and then the fuzzy spot (Trapezium which includes the Orion Nebula) looks like a sword or other item hanging off the belt. This is a picture of the Orion Nebula I took through my telescope, you can make out the shape with just binoculars from a reasonably dark location. Hadn't planned to watch, but woke up and went out on the deck... A great view... clear and with no lights around (quiet week for campers)... a fantastic view. Watched for a full hour, from the full to the last little crescent. The stars were so bright and beautiful, that it made me wonder why I haven't been watching the night sky... for many years. So now... I've dug out my telescope, and star maps, and will doing it more often... My college astronomy professor would be proud of me. I had to use a hand mirror. Nope, not a crude joke. Locally, the blood moon was so high in the sky that our lanai overhang made it impossible to see. With a hand mirror, I could watch the eclipse which was virtually unobscured by clouds - very rare in these parts - especially for an hour at a time. Otherwise, I would have had to get in the car and drive several miles to get a better vantage point.